Beans are a staple in our house and have been ever since I was a kid. Often served as a side dish or added to a pot of chili, we love our beans! Back then, pinto beans and kidney beans were the norm. Not until I started cooking myself, did I start to try other varieties of beans. Black beans are a favorite of mine and I add them to a lot of different recipes. 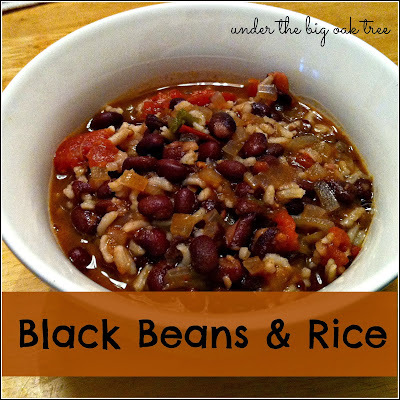 Earlier in the week, I shared a recipe for Chipotle Black Bean & Rice Soup. I adapted that recipe to make a heartier dish. Quick and easy to make, this deliciously frugal meal was a hit! Cook onion and chipotles in a small amount of oil. When onion is just about tender, stir in the cumin and garlic powder. Continue to cook until onions are tender. Pour in the chicken broth, tomatoes, water and adobo sauce. Stir in one can of the beans. In a bowl, mash the other can of beans with a fork, to desired consistency. Add to soup. Remove from heat, stir in the uncooked Minute Rice (if using). Cover and allow to sit for 10 minutes. Serve hot. Garnish with sour cream or guacamole if desired. This turned out a little soupy for the first night, which was just fine for us. I didn't want to risk using less liquid since I knew it would absorb when I put the leftovers away. If you want to cook your rice separately, omit the water in this recipe and possibly decrease the broth a bit. While we both enjoyed this as a meatless meal, we both thought it would be wonderful with some smoked kielbasa added! Mmm! So good! This was a perfect meal after working outside in the chilly fall air! I will be making this one again! YUM! I love black beans, so I'm pinning this post.